Many visitors come on holiday to Rwanda to see its famous mountain gorillas, sometimes as an add-on to a safari in Kenya or Tanzania, stay for just three or four days and then leave, which is a shame because there is so much more to see on a Rwanda holiday. With three national parks, a thriving capital city, spectacular mountain scenery and some surprisingly diverse wildlife, Rwanda have plenty to occupy a longer holiday and certainly deserves further exploration. Volcanoes National Park in the north-west of the country is the most famous of Rwanda’s parks and is the place that most people come to on holiday because of its renowned residents, the mountain gorillas. Rwanda’s gorilla trekking is its biggest attraction. Less well-known holiday options are Akagera National Park on its eastern border and Nyungwe Forest National Park in the south. Tracking mountain gorillas in Rwanda is the ultimate wildlife experience and the reason why most people come here on holiday: sitting within a small family group of gorillas is a ‘must’ for serious wildlife enthusiasts. This is where Dian Fossey first brought the world’s attention to the plight of these majestic primates in the late 1960s when only around 250 survived. The 2011 census recorded some 880 individuals and, encouragingly, the 2017 count numbers over 1,000 mountain gorillas, split between Rwanda, Uganda and the Democratic Republic of Congo; about half of them live in Rwanda’s Volcanoes National Park. The survival of mountain gorillas is one of Africa’s greatest conservation success stories, and tourism has played its role in this. Rwanda is regarded as probably the best destination for a gorilla tracking safari. Although gorilla tracking permits aren’t cheap, your permitted hour with these great apes promises to be a priceless encounter that will remain with you long after your holiday is over. To learn more about this fabulous experience, see Rwanda gorilla trekking safaris. Although mountain gorillas are the stars of the show, there are plenty of other primate tracking opportunities while on holiday in Rwanda. Nyungwe Forest National Park is home to thirteen different primate species, among them chimpanzees and Rwenzori colobus, both of which can be tracked. Indeed, Nyungwe’s colobus monkeys can sometimes be seen in spectacular troops of several hundred, believed to be among the largest numbers worldwide. And in Volcanoes National Park, two groups of endangered golden monkeys have been habituated for visitor tracking. Pretty and playful, they’re a delight to watch. Rwanda may not seem the obvious choice for a typical safari holiday, but if you’re travelling here anyway, Akagera National Park in the east of the country is worth exploring. Scenically it is one of Africa’s prettiest parks, with rolling hills and deep valleys, savannah plains to the north and lakes and papyrus swamps on its eastern border. It includes the largest protected wetlands in Central Africa and is home to some 8,000 animals and over 480 species of birds that include the rare shoebill, making Akagera an interesting destination for a bird watching holiday. Since the re-introduction of black rhino in May 2017, it’s now also a ‘Big 5’ park. Holidays in Rwanda are possible all year, but the most popular times to travel are in the long dry season from June to September, and the shorter dry season around December to February. If you’re intending to track gorillas, you’ll need to plan your holiday well ahead to secure permits – especially around July to September. 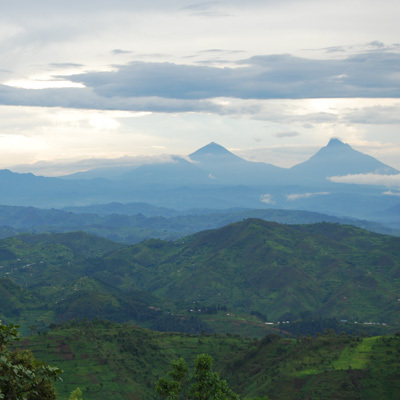 Rwanda’s main rainy season is from March to May, with shorter rains in October and November; to find out more see Rwanda’s weather and climate information. Travel in Rwanda is very comfortable on our safaris. The roads are largely good asphalt surfaces with many new roads being constructed to replace dirt roads. It’s not a place to drive yourself; our travellers use one of our private guides and 4WDs – allowing them to control the daily schedule and pace of their Rwanda holiday. It’s a lovely way to see the country, often with beautiful views around every corner. Although there are some excellent hotels, Rwanda’s facilities can sometimes be basic; service and food can, at times, be a little lower than you’d hope for, as many staff are new to tourism. However, to glimpse the heart of contemporary Africa, for some wonderful wildlife viewing and inspiring, thought-provoking travel, a holiday in Rwanda can be fascinating. Rwanda is a surprising and inspiring country for a holiday, not least because of the remarkable way it has united in the years since it tore itself apart during the horrific genocide against the Tutsis of 1994. Whilst it would be naïve to suggest that the entire nation has moved on, a holiday here leaves you with an overwhelming sense of the people’s optimism and national pride, and their determination that genocide must never happen again. Today, people call themselves Rwandans, with no distinctions between Tutsis and Hutus. Yet remembrance is as much a part of the country’s progress as reconciliation. Each year, from April to July, commemorations called Kwibuka to take place as part of the country’s healing process. And at any time of year, a visit to Kigali’s Genocide Memorial is important in understanding Rwanda’s history and the events leading up to the genocide. It may seem an unlikely holiday attraction but it is, in fact, a beautiful, peaceful place that is a testament to Rwanda’s strength and spirit of reconciliation.